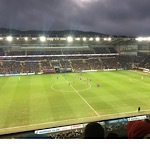 Cardiff City Football Forum | Cardiff City FC Messageboard • View topic - Rolf Hasslet - Next P45 ? Rolf Hasslet - Next P45 ? The Rolf Haslet resurgence didn't last long. He seems to have given up already. After the game today he seemed desolate and said twice that he couldn't see his team staying up and had nothing remotely positive or encouraging to say about them. His day just got much worse too , with Burnley now winning 3-1 away, which will put Southampton straight back in the danger three where they were when he took over. Southampton are known to be trigger happy when managers have a bad spell , so I wonder whether they'll bugger their chances altogether with a panic sacking. I can see it happening and it's the worst thing they could do at this stage. I said that Fulham would regret the same move , and I think today's performance proves that. It's not directly going to effect the relegation places, but Everton look like making the same mistake and that could help us too if they do it before we play them very shortly . Re: Rolf Hasslet - Next P45 ? I think you're right there, but if so they probably won't get time to settle down before we play. The Leicester guy is drinking in the Last Chance Saloon as well. Claud Suet isn't it ? Hope he stays for the game against us but if we beat them I think he's done. Agreed my son in law supports them and they have the knives out for him. Pity really cos given time I think he would do ok.
Don't see them getting rid of Ralph Hassenhuttl tbh, he's done better than Mark Hughes and were unbeaten in 5 before playing us, but stranger things have happened I guess. Marco Silva is walking a tight rope mind, I think he's massively overrated and if it wasn't for the fact he's foreign and has an accent and claims to play "The right way" I don't think he'd have got the Everton job, and I don't personally feel he deserved it after Hull got relegated anyway and Watford were in free fall by the end of his reign there. I think the next to go will be Claude Puel as Vardy and a few other seem to be unhappy with him and the fans really don't like him there. I think the everton fans have had the knive's out for quite a while for anyone not just the manager starting at millwall. billy ronson wrote: Sarri ? I think we played Southampton at the right time. If Ings and Lemina were playing, it could have easily been a different result. That was Southampton's first league defeat in 2019. They've drawn away to Chelsea and won away to Leicester recently. They lost to us with a couple of key players missing. I think the thought of the Southampton manager getting sacked is madness at the moment. I do hope their "honeymoon" period under their new manager is over though and they start going on a poor run. I don't think their managers negative attitude will be any help to them at all. Tonteg Bluebird wrote: I think we played Southampton at the right time. If Ings and Lemina were playing, it could have easily been a different result. That was Southampton's first league defeat in 2019. They've drawn away to Chelsea and won away to Leicester recently. They lost to us with a couple of key players missing. I think the thought of the Southampton manager getting sacked is madness at the moment. Yeah you're right that it'd be madness, but that won't necessarily stop it happening. They have a tendency to blame the manager very quickly there as we've seen before . In any case, I'm thinking Claude Suet will be the next to go now , with the players staring to brief against him. Sarri, Silva and Puel all much more likely to go first. Everton want Bielsa, not sure if he would leave Leeds yet, they may stick until the end of the season, or do a Manu and get a temp in until the summer? worcester_ccfc wrote: Sarri, Silva and Puel all much more likely to go first. Agreed I think Rabbit Hutch at Southampton will stay at least until the end of the season, Puel next I think !! !